Judith O'Dea (born April 20, 1945) is an American actress. She is best known for her role as Barbra in the 1968 George A. Romero film Night of the Living Dead. 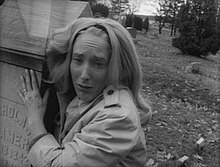 O'Dea as the catatonic and helpless Barbra in Night of the Living Dead, seen here with Duane Jones. In addition to her signature role, O'Dea has appeared in the television movie The Pirate in the 1970s. She later took a break from acting to focus on raising her family. In the new century, O'Dea returned to acting in several low-budget horror films, including Claustrophobia, Evil Deeds, October Moon and Women's Studies. She also returned to the Barbra role for the upcoming Night of the Living Dead: Genesis. She owns and operates O'Dea Communications, a firm which deals in oral-communications training. ^ "First Look at Judith O'Dea in Night of the Living Dead: Genesis". Dread Central. 20 February 2015. Retrieved 7 October 2015. ^ "'Night of the Living Dead's' Judith O'Dea Returns In 'Genesis'!". Bloody Disgusting. 2012-06-15. Wikimedia Commons has media related to Judith O'Dea. Judith O'Dea on IMDb . This page was last edited on 11 February 2018, at 02:01 (UTC).